beta Euclid's Elements, Book VII - Elementary Number Theory Definitions. A journey from Greek, through Arabic, Sanskrit and English. In 300 BCE* Euclid of Alexandria wrote 'The Elements' in Greek. It presents an overview of Greek mathematics at the time. While Euclid wrote 'The Elements' it contained the mathematics of both Euclid and others. Book VII on elementary number theory is considered to be Pythagorean and dates back to around 540 BCE. Around 1220 CE^, in what is now modern day Iran, 'The Elements' was critically edited and translated into Arabic by Muslim scholar Nasir al-Din al-Tusi. From this Arabic edition it was translated into Sanskrit by Jagannātha Samrāt in 1719 CE and called The Rekhāgaṇita. In 1902 the Sanskrit Rekhāgaṇita version of Euclid's Elements was edited and issued by K.P. Trivedi. I have extracted the number theory definitions from Vol. 2 of The Rekhāgaṇita. From Trivedi's Sanskrit edition, in 2013 Professor Avinash Sathaye provided a translation at my request. P.S. A variety of English translations of Euclid's number theory definitions (post Heiberg) can be read here. As the order of the definitions vary, it is better to read down the Greek definitions and then read down the Sanskrit definitions. The English translations below are © Dr Henry Mendell. Source. A number is a collection of units. In that sense, the unit (1) does not have the property of being a number. Others say that what can be counted is a number, and in their opinion unit has the property of being a number, for it can be counted. When a small(er) number is severally removed from a big(ger) number and the big number becomes without remainder, then the small number is a factor of the big number. (In this case) the big number is the multiple times the small number. One which has two equal parts should be known as an even number. One which does not have two equal parts is an odd number. When an even number is reduced or augmented by 1, it is also known as an odd number. An even number is of two types: one even-even (8), another odd-even (6). Even-even is thus: an even number when it gives an even result after division by an(y) even number, then it is even-even. An even number when it gives an odd result after division by an even number, it is known as even-odd. Now the definition of odd-odd. An odd number, when it gives an odd result when divided by an odd number is an odd-odd number. For example 9 when divided by 3, one gets 3. A number, which when divided by a number bigger than 1 does not leave a zero remainder; it is to be known as a prime number. The number 11 for example. One that can be divided by a number bigger than 1; it is to be known as a composite number. Two numbers, which give a zero remainder when divided by a number bigger than 1 should be known as joined. Two numbers which don't give zero remainder by any any number bigger than 1 are to be known as separated numbers. A number multiplied by itself; its result is a square (number). A number multiplied by its square is known as a cube. A number is said to multiply a number whenever as many units as there are in it, so many times the multiplied number is added and becomes some number. The result of multiplication of the number to be multiplied and the multiplier is called an area (measure of a field). The one to be multiplied and the multiplier are called parts (arms). An area multiplied by a number becomes volume. When a first number multiplied (by some multiplier) becomes the second number; and a third number multiplied by the same multiplier becomes the fourth number; then they become similar (proportional ) numbers. Area and volumes become similar (proportional) when their parts (arms) are proportional in the same manner. A number which is equal to the sum of its parts (factors) is known as complete (perfect). Similar plane and solid numbers are those having proportional sides. A perfect number is one which is equal to all its parts. You will see that Jagannātha Samrāt does not provide a definition of multiplication to match Euclid's. This may be because the Arabic definition of multiplication in al-Tusi's text may have differed significantly from Euclid's. The Arabic definition of multiplication** contained in a 1594 edition of the Elements reads as follows: "Multiplication is when one makes one of two numbers a unit of another number. So the unit of the units of the multiplicand is assigned [the value of] the multiplier, and what is gathered is the result of the multiplication." This was not intended to be a literal translation of Euclid's Greek, but rather a modification of Euclid's book for a medieval 16th century Arabic reading audience. 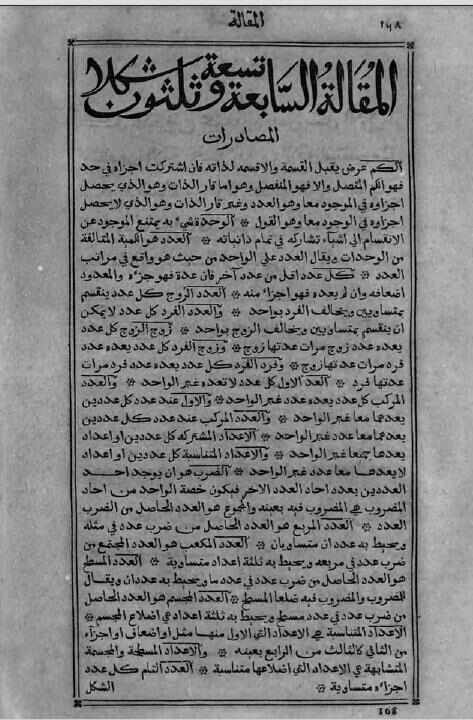 The 1594 Arabic text attributed to al-Tusi (yet written several decades fter his death) containing Euclid's elementary number theory definitions is provided below. The author of this page, Jonathan Crabtree, is most grateful to Professor Avinash Sathaye (Sanskrit scholar and professor of mathematics) for providing the above translations from Sanskrit into English of Euclid's definitions of number theory in Book VII of the Elements.